If nothing else, this episode affirmed that Ben lies. A lot. And very well. In about one minute, he had Caesar ready to shoot Locke, just on his word. In the course of the episode, he offered two vastly different reactions to Locke's resurrection: that while he believed it was possible, it was still amazing to see it actually happen, and that for all he's seen and known on the island, dead is dead and Locke's state is as unexplainable and shocking for him as it is for everyone else (of course, whichever reaction is true further colors his murder of Locke in the first place: was he putting balls in play or selfishly eliminating a rival?). Which reaction is the truth? Ghost-Alex's assertion that Ben is already planning on killing Locke suggests the later. But the episode also affirmed, along with Ben's deceitfulness, that "truth" is relative and colored by perception. The assumption has always been that Ben's abduction of Alex was an act of cruelty and selfishness: Ben wanted a daughter so he took one, and left the mother alive to suffer her loss. Now, it seems that abduction was an act of mercy: ordered to kill Rousseau, Ben comes up short when he finds Alex, and decides to raise her in order to protect her. In the end, the distinctions between Ben's truths and his lies may never be made entirely clear. However, it is slowly becoming clearer that between Ben and Widmore, Ben is the "good" guy, relatively speaking, as far as the island is concerned. 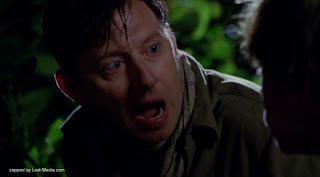 Ben genuinely seems to act in the interests of the island, whereas Widmore is shown in the 70s to be uncomfortable answering to a higher power on the island, be it Richard or Jacob, while the discussion of his exile clearly show he wanted more from life than what the island was giving him. While Widmore was willing to kill Ben's daughter, Ben was reluctant, both with Alex and later little Charlie, to kill a child's mother. Perhaps recalling his own mother-less childhood, this mercy is, perhaps, the one bit of innocence left in him after being healed in the Temple, and what distinguishes him from Widmore in their struggle for control of the island. Watching Ben in action, lying to Caesar. "I just didn't have time to talk you back into killing yourself." Young Ben wakes up and Widmore is at his bedside, just as he was when Locke woke up in Tunisia. 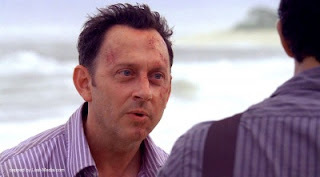 When Ben wakes up on the island, Locke is in Widmore's position at his bedside. Walt told Locke when he visited him that Walt had dreamed of Locke on the island, in a suit, surrounded by people that wanted to kill him: perhaps the scene at the boats when Ben killed Caesar was the realization of that dream. Dr. Bitz said that all Ben needed, circa Alex's abduction, was a little mustache and he'd have looked like Hitler's long lost twin. The whispers were mentioned again: if the Others aren't the cause of them, they're obviously knowledgeable about them. Ben's warning to Rousseau also suggests why she was never found by Dharma nor ever found them, assuming they never ventured to her section of the island. Ben did indeed summon Smokey to dispatch the mercenaries in "The Shape of Things To Come." Apparently, Smokey is called by the flushing of a dirty, ancient toilet. Widmore was exiled because he "broke" the rules by frequently leaving the island and having a daughter in the "real world." 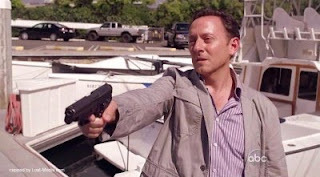 When Alex was killed by Keamy, Ben said that Widmore "changed" the rules. Are these the same rules? Why was killing Alex changing the rules but not breaking them? Now we know Penny wasn't born on the island. Penny and Desmond's boat is "Our Mutual Friend" named for the Charles Dickens novel Desmond had with him in the hatch, containing a letter from Penny. It was the only Dicken's novel he hadn't read, as he was saving it for when he was about to die. The place where Sun and Frank met Christian WAS New Otherton. 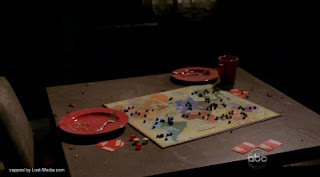 The Risk game Hurley and Sawyer were playing before Keamy's attack was still setup in Ben's house. 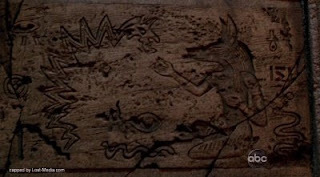 I have no conclusive idea what this picture is representing, but the dog/jackal headed figure on the right is Anubis, Egyptian God of the Dead. Presumably the figure on the left is some approximation of Smokey. Just as Eko saw images of his life flash before him as Smokey judged him, so did Ben. And a dead relative (presumably Smokey) appeared before Ben afterwards just as Yemi did to Eko. What was the critical info that would have died with Locke: Ms. Hawking or Jin's survival? Presumably the former, but Ben sure seemed surprised to hear about Jin, and he didn't kill Locke 'til after that info came out. Is this truly the end of Caesar? He seemed to be establishing himself as more than a redshirt with lines, but perhaps that's all he was. How is Ben moonlighting as an Other and still a part of Dharma at the time of Alex's abduction? What about Ethan, for that matter? 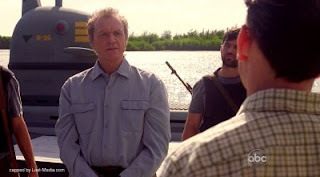 Has Widmore ever been as "connected" to the island as Ben and Locke? How does Ben know about the donkey wheel, if Widmore's exile didn't involve him using it? We may never really know, but which of Ben's stories is true: did he truly believe Locke would be resurrected on the island, or was the complete disbelief and ignorance he expressed to Sun for real? Was the secret Smokey summoning room there when Dharma built those houses? How'd they miss/not investigate that? What was Locke doing in the jungle when he emerged as Ben was waiting for Smokey? What happened to Ilana and her gun-toting cronies? Are they Widmore's men or converts of Smokey (like Rousseau's crew)? 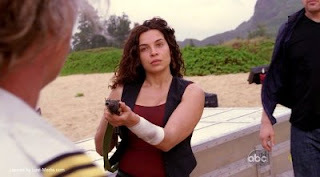 Was that why Smokey didn't respond to Ben's summons, because he was on the other island "infecting" Ilana and company? What's in the crate on the beach? Ilana and the others seemed to be interested in it even before Frank returned and they were all weird. What does lie in the shadow of the statue? Star Wars puns and Dr. Chang shenanigans. Actually, I believe that in the war between Ben and Widmore they are both bad. Perhaps equally so? (Ghost-Alex didn't think Ben was very "good".) Only Locke is good. So both Widmore and Ben are trying to manipulate Locke, the Island's chosen one, to get in good with the island again. Or...something. 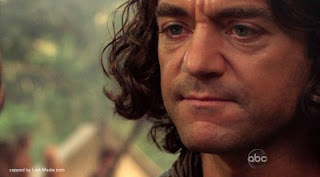 I also believe that Ben is destined to sacrifice his life for Locke and the good of the island at some point, probably in the final season. Finally, I heard a theory that the "dirty water" was actually Smokey in its contained, liquid form. So unplugging the drain releases Smokey and let's it take its smoke form. I'm in the "Ben is good", relatively speaking, camp, but I'll be the first to admit that's wishful thinking on my part and that I won't be stunned if things to turn out to be more like what you're suggesting. I like the idea that Smokey was the water. It makes me think of the vent it came out of under the temple: it could look like a nozzle, something that would "spray" the liquid Smokey out as a gas.